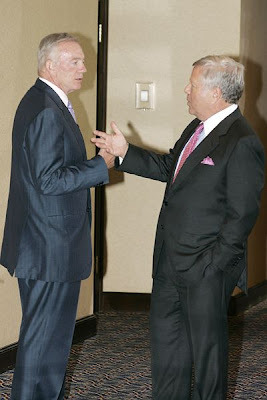 Cowboys owner Jerry Jones and Patriots owner Bob Kraft were at the Comcast Center yesterday for a meeting. Was their presence related to the dispute between the NFL Network and Comcast over Comcast charging cable customers a premium for the channel? Probably, because Kraft chairs the NFL Broadcasting Committee and Jones the NFL Network Committee. Comcast declined to comment and an NFL spokesman said he was unaware of the meeting. While Jones and Kraft walked through the building, a Comcast employee asked Jones if he planned to get rid of Terrell Owens. Jones smiled and dodged the question. While the reason for the visit isn't exactly known, I'm inclined to believe that the above explanation is by far the most likely scenario. It's seriously in the best interest of the League to get this whole thing figured out, because as it sits right now, people across the country are still having trouble finding the network on their channel guide. This situation has really become ridiculous. I have Comcast digital but don't pay the extra money for the NFL Network. If they include it as part of the package I get, fine. But I'm not paying to watch a schedule of games that are mediocre at best. Even if I had NFLN I really don't think I'd watch it that much. I turn off ESPN enough every time NFL Live comes on, why would I turn to a 24 hour version of NFL Live? I like watching my team, that is it. that is 3 and half hours one day a week. That is all I need. Are you sure they didn't go to the Comcast Center to meet Gary Williams and check out the Maryland-Duke game? Is it possible they're looking to do a deal with Comcast that would involve merging NFLN with Versus (similar to the failed negotiations to merge NFLN with ESPN Classic)?